The work that has been done to the historic Campanile in Strand Street, Port Elizabeth is absolutely world class. The special computerised, purpose-built, electro-mechanical bell ringing system, ghost bells and lighting were installed by http://straton.co.za. 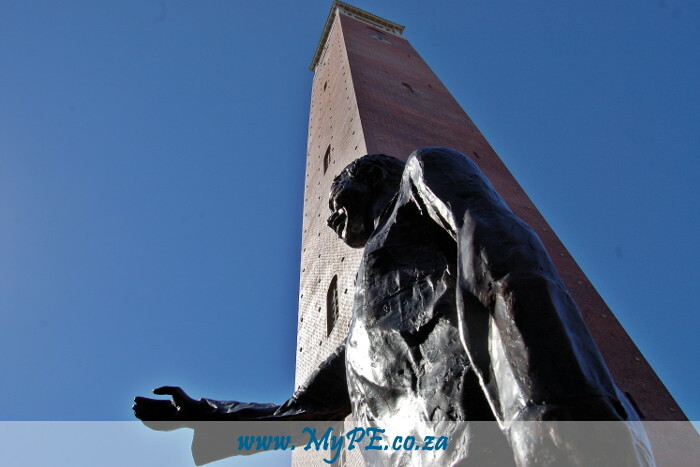 The Nelson Mandela Bay Municipality (NMBM) announced today that renovations and upgrading of the Campanile, one of Port Elizabeth’s most visible skyline and audible heritage landmarks has been completed ahead of Heritage Month. The newly upgraded Campanile was unveiled by Nelson Mandela Bay Executive Mayor Athol Trollip during a media launch held on Tuesday, 15 August 2017. “The upgrade and renovations was undertaken with several integrated development planning goals in mind such as growth and development of the city’s tourism and creative economies, and relaunching the Campanile with a more inclusive heritage identity through the vehicle of urban renewal and regeneration,” said Mayor Trollip. 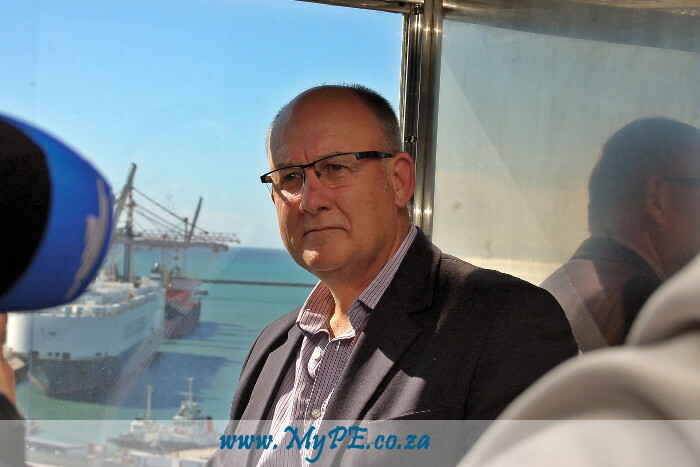 Executive Mayor Athol Trollip takes in the views from the observation deck capsule at the top of the 50m Campanile memorial. “It most certainly introduces a very creative product to our existing basket of heritage tourism assets. It will also offer residents, tourists and holidaymakers a world-class tourism experience. The new upgrades and renovations introduce a host of new features and activities pushing the envelope and with the potential to revive tourism experiences at other heritage sites. Some of the new features of the Campanile include an interactive visual-technology array dubbed ‘Ghost Bells’ – bell proxies installed under the actual bell carillon which visually light up during chiming or when visitors press keys of an interactive silver console to match the pitch of a key with the corresponding bell. Another addition includes the harbour viewing window – an observation deck capsule at the top of the 50m Campanile memorial, suspending visitors in the sky when they overlook the Port Elizabeth harbour. A special computerised, purpose-built, electro-mechanical bell ringing system has also been installed for the Campanile’s 17 ton bell carillon that were removed, restored and reinstalled by the MBDA over the last year to ensure that the crispness of each bell was pitch perfect. The Campanile bell can now play any melody which gets programmed into its state-of-the-art digital interface. A new reception area that will act as an information desk and several exhibition areas within the Campanile for the city’s creative communities has been developed. All of these new features offer a welcoming start to the city’s iconic Route 67 – a public art urban meander dedicated to Nelson Mandela which has its starting point at the Campanile. It almost feels like Former President of South Africa, Nelson Mandela, is extending the hand of welcome to visitors to the Campanile at the start of Route 67 dedicated to the life of this great statesman. The Campanile has also been upgraded and developed to be an economically-purposeful asset particularly to grow, develop and promote Mandela Bay’s creative and arts economy, said Executive Mayor. Pointing to recent studies by the South African Cultural Observatory (SACO), Executive Mayor said the cultural and creative industries grow at a faster rate than non-cultural sectors of the economy. “To keep with this growth trend and to ensure that the city provides ample opportunities for creative and arts communities, several galleries and exhibition spaces have been incorporated on various floors of the Campanile memorial. “The inclusion of these spaces will ensure that the city’s arts, culture and heritage communities benefit from heritage tourism and urban renewal. Executive Mayor said while the upgrades and renovations of the Campanile focussed on fixing a memorial site which began falling into disrepair, the city simultaneously had to explore how it would decolonise the heritage landscape of the Campanile. “A strategic imperative was to construct a new heritage identity for the Campanile,” he said. The Executive Mayor also noted inscriptions in Afrikaans and isiXhosa were made on some bells – as all but six bells were contributed chiefly by descendants of the 1820 settlers as tribute to their forebears. Through new inscriptions, the bells have been rededicated to all people of Nelson Mandela Bay and also the deceased crew of the SS Mendi, a ship which sank in 1917 in the English Channel and resulted in the deaths of 646 people, most of whom were black South African troops. “Other features such as a silver plaque on the 67th step of the 204 steps spiralling staircase to acknowledge Nelson Mandela’s 67 years in service of democracy, had also been included as the new feature of the building” he said.